I’ve drawn attention to the remarkable work of Cary Karacas before, notably the mesmerising essay he co-authored with David Fedman, ‘A cartographic fade to black: mapping the destruction of urban Japan in World War II’ [Jnl. historical geography 38 (2012) 306-28], which quite rightly won the prize for the paper published in the journal that made ‘the greatest contribution to the advancement of scholarship in historical geography’ in 2012; it’s available here. 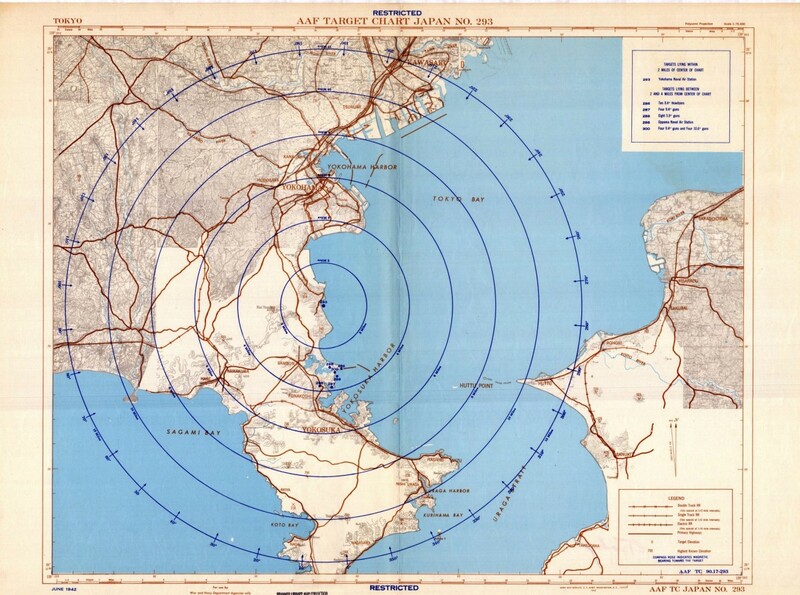 Bombing depends upon a whole series of cartographic visions, and there is something exquisite about using maps to expose rather than plan violence from the air like this. You can also get a sense of their work from this beautifully illustrated essay by Eric Jaffe for the Atlantic last year, ‘Mapping urbicide in World War II’, and from this special (open-access) issue of Asia-Pacific Journal: Japan Focus Cary edited with Bret Fisk on ‘The fire-bombing of Tokyo: views from the ground’. 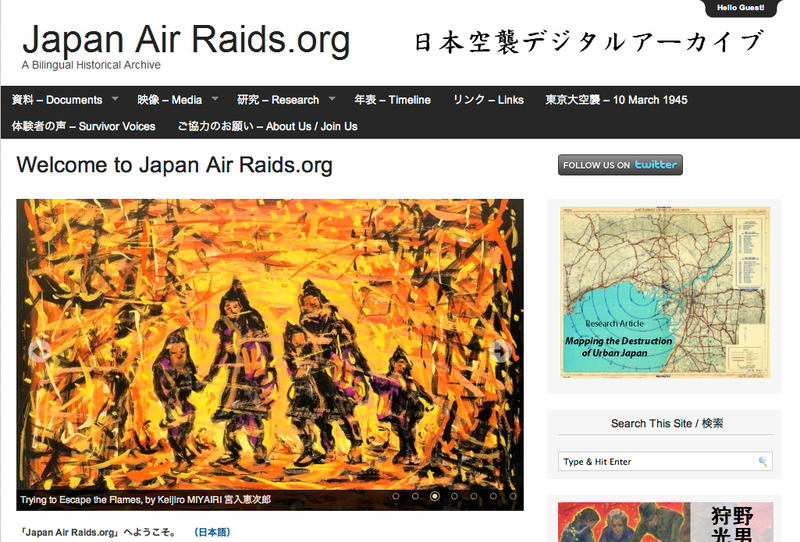 Working with Bret and translator Eri Tsuji, Cary also launched a new website, Japan Air Raids.org, which is a bilingual (hooray!) digital archive providing an extraordinary range of primary and secondary materials on the US bombing of Japan in the Second World War. In Japan it took over twenty years following the end of the World War II before people began to make a concerted effort to remember the incendiary raids that destroyed a significant percentage of most of Japan’s cities, wiped out a quarter of all housing in the country, made nine million people homeless, killed at least 187,000 civilians, and injured 214,000 more (source). Thanks to the many Japanese citizens who over the last forty years have labored to write down survivor accounts, locate and preserve various records, and analyze the destruction of urban Japan (and the concurrent suffering and social upheaval that occurred), the history of the air raids has taken root in Japan in a variety of ways. Numerous books and articles have been published, resource centers and peace museums have been built, and both individuals and associations continue to carry out important research. Outside of Japan, the lag time to look closely at the impacts of the air raids is even more pronounced. In 1977, historian Gordon Daniels lamented the fact that academics had largely ignored the air raids on Japan – and the so-called Great Tokyo Air Raid in particular – as a subject of inquiry. Little has changed since this observation. While a handful of important English-language books and articles have appeared since then, most deal with the topic strictly from the standpoint of examining, and on occasion criticizing, U.S. strategic bombing doctrines and campaigns. Analyses about what the air raids entailed for the Japanese civilians on the ground and the cities in which they lived have yet to be written. Consequently, interested citizens and intellectuals who cannot read Japanese have minimal access to materials that shed light on the devastating effects of the incendiary bombing campaign on Japanese communities, cities and society. Additionally, while considerable English-language primary and secondary source documents related to the air raids exist, to date they have been beyond the reach of most people save for a handful of individuals who possess the inclination, time and resources required to visit the physical archives holding them. By taking advantage of technological developments that allow for digitization, storage, and global retrieval of documents, we hope that this digital archive will play an important role in encouraging people to learn about and further research this area, and in fostering collaboration among a variety of individuals and groups. Additionally, by democratizing archival access to materials related the Japan air raids, we hope to open this field to the general public, scholars, professional and lay researchers, university students, and even middle/secondary school educators and their pupils. The project is ongoing, but it’s already clear that this is a stunning achievement – visually, intellectually and politically – and a truly generous and absolutely indispensable resource. This entry was posted in bombing, cartography, cities, imagery, Japan and tagged air raids, Bret Fisk, Cary Karacas, David Fedman, Eri Tsuji, firebombing, Japan by Derek Gregory. Bookmark the permalink.